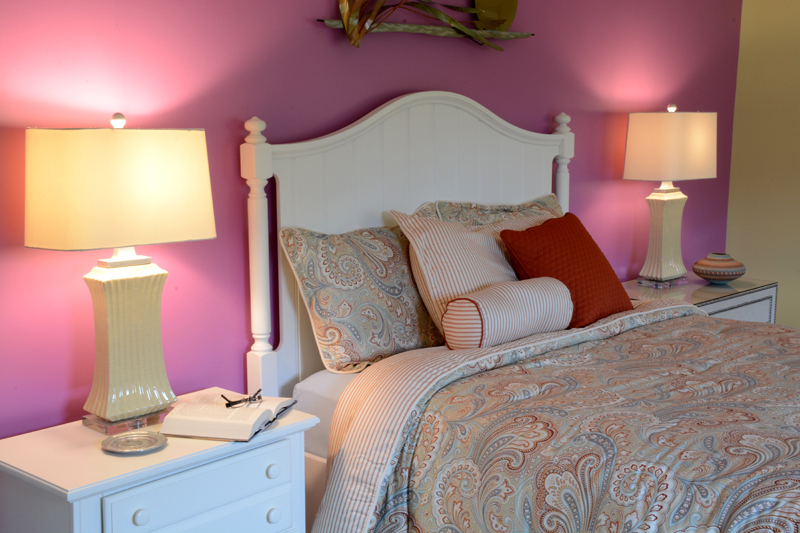 MONI’S RETREAT – Guest Bed | Rehoboth Beach, DE This chair once belonged to my client’s mother. It was reupholstered and given a new home in the Guest Bedroom. 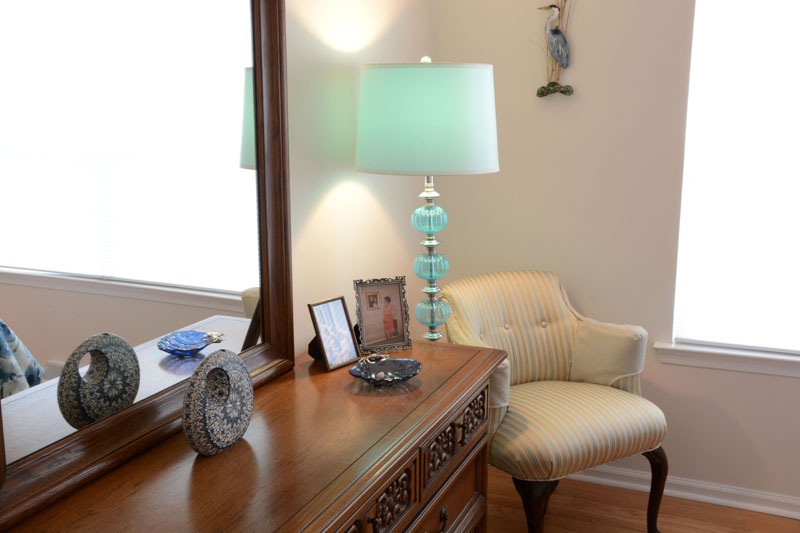 The blue glass lamps reminds us not only of sea water but of artfully created sea glass and marine life. 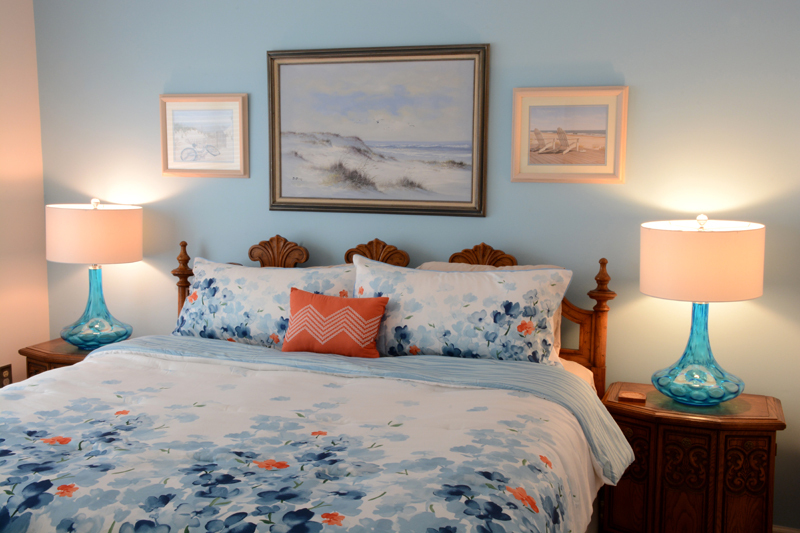 MONI’S RETREAT – Guest Bed | Rehoboth Beach, DE When invited to a week by the beach, one expects to feel at the beach! Hence we transformed the this dark gray room with its single exercise bike into the beach haven you see here! We accomplished this with the colors of surf, sand, marine blues a drop of sunset and accenting the room with local watercolor beach scenes. 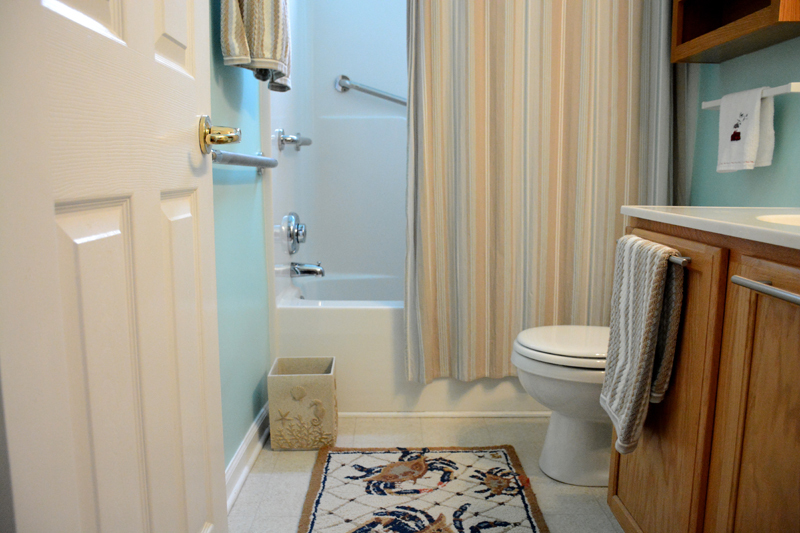 MONI’S RETREAT – Guest Bath | Rehoboth Beach, DE The woven bath rug is ocean themed and stretches from the bath to the vanity. 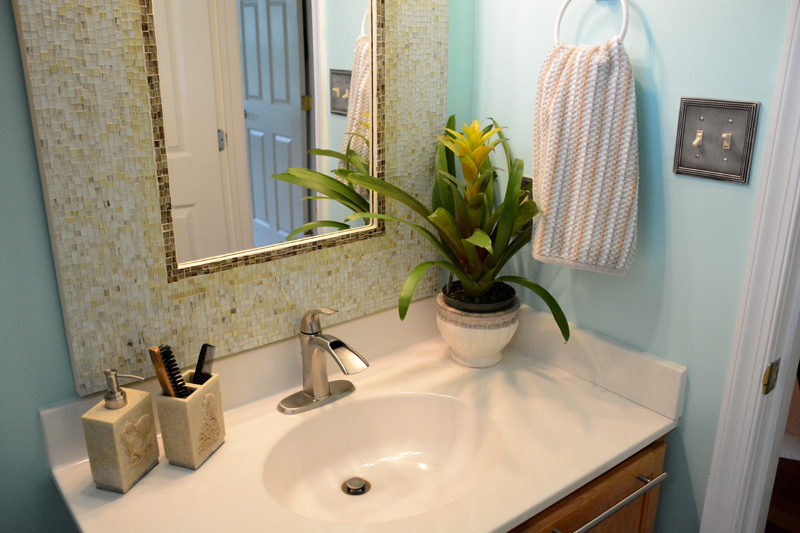 This visually elongates the bathroom and give the illusion of more space. We added storage above the water closet. MONI’S RETREAT – Guest Bath | Rehoboth Beach, DE Once a gray,dated and foreboding room, we manipulated light, color and texture to create a warn inviting environment for relaxing and social gatherings. This was inline with Moni’s desire for a fresh start reflective of her resolve to enjoy her life as a widow. The sofa was retained for sentimental value. MONI’S RETREAT – Master Bed | Rehoboth Beach, DE We started the master bed by customizing it to function around Moni. A new color palette was selected. We added new solid wood furniture, lighting and bedding. 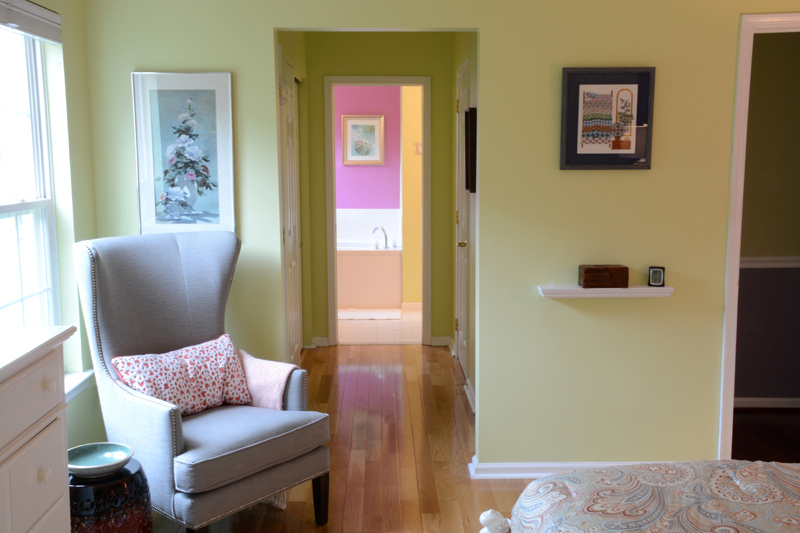 Colors and patterns where selected according to my clients needs and preferred mood for the room. MONI’S RETREAT – Guest Bath | Rehoboth Beach, DE The new mirror hints at the sifting shades of sand and appears to be made of fragments of shell and coral. 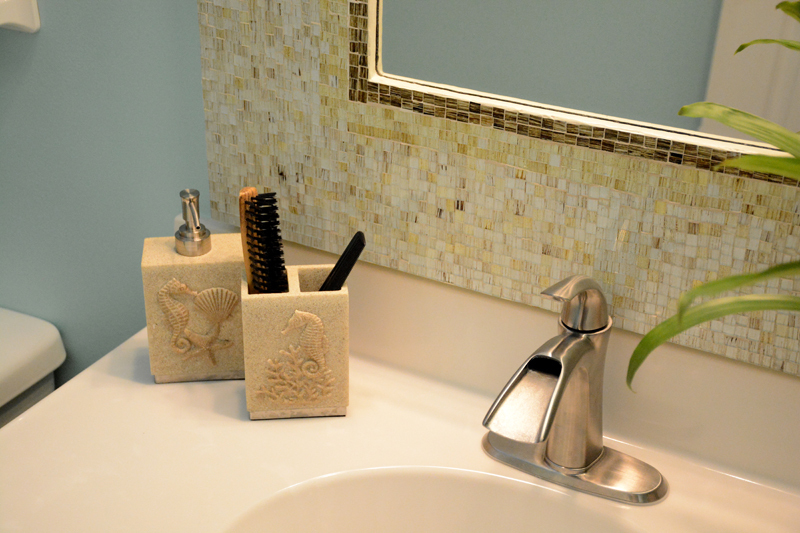 The subtle raised relief sea creatures on the accessories links this bathroom to Rehoboth Beach, its town and experiences. MONI’S RETREAT – Master Bed | Rehoboth Beach, DE The easy chair is located next to the window to maximize the use natural light. The pulldown block-out shades in the bedroom windows can darken the room at will. This view provide a sneak peek of the jacuzzi area in the Master Bath beyond. 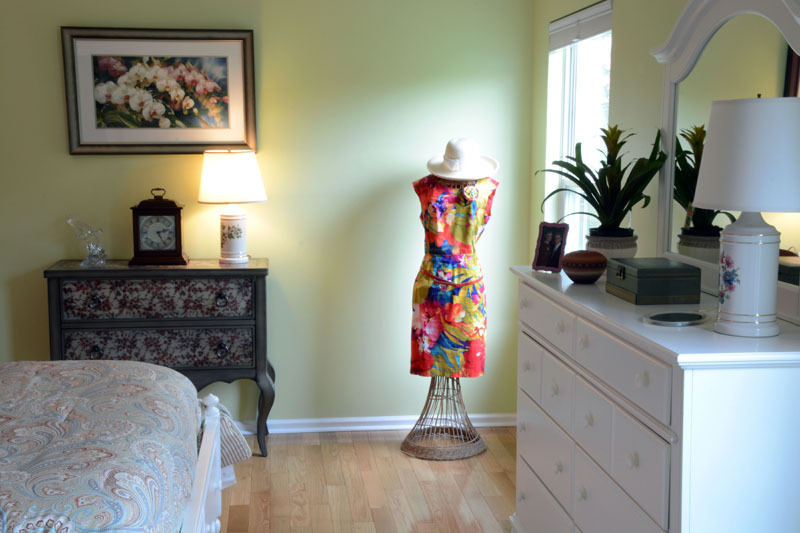 MONI’S RETREAT – Master Bed | Rehoboth Beach, DE Storage is often an issue in bedrooms. Here we provided ample storage, beginning with the drawers in the foot-broad, night stands, chest and in the unique hand painted two drawer chest you see here.